A page dedicated to The Black One, only reason being shes now dead(ish). She spun her number two big end bearings 13 months after Id fitted a second hand B235R engine, TD04 turbo & had the ECU remapped to stage 2. This also badly scored the crank, but it looks as if a blocked oilway in the crank caused the bearing failure in the first place, so once again yet another 9-5 engine bites the dust due to oil starvation issues. My goal was to turn this bog standard MY98 2.0 lpt 9-5 into a monster 2.3 fpt Aero beater & I got there in the end, & boy was she a joy to drive. I have been given a B234R engine out of a MY96 9000 Aero belonging to my good friend Nev (UKSaabs admin guy & all round nice fella) so this may well find its way into Blackie in the near future, but she also now needs alot of new parts including brake upgrades, brake pipes, an uprated clutch kit (as the stage 2 tune ate its way through the standard 2.0 lpt clutch kit very quickly, as I knew it would) plus an exhaust system & various other parts Ive robbed off her to spruce up her everyday replacement (the silver Aero now featured on the index page). I still have The Black One here but her future is undecided at the moment, she may at some point get rebuilt or turned into a track hack for weekend fun, but for now shes sat outside up on axle stands & looking very sorry for herself. I have to say a massive thankyou to Nev, Karl (Saabnoob, aka Noobtune), Simon (Saabotage), Carl (Csaab), Rob Beard , Wessy (Nottingham Saab) & many other members of UKSaabs, SSJ (Salop Saab & Jeep) & Westbury Saab in Shrewsbury who have all helped me out with parts, tools, help & advice over the past seven years. Without their help The Black One would have been scrapped long ago so thankyou very much guys. 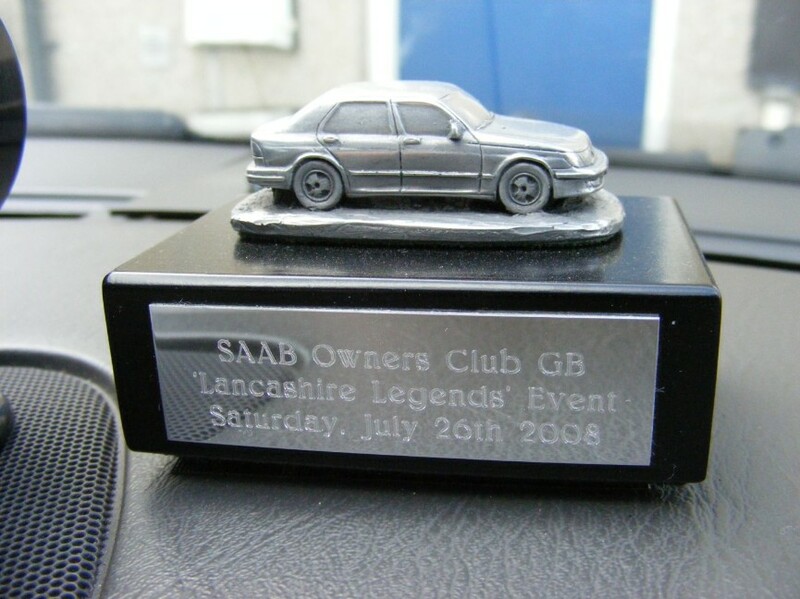 Also a great big thankyou to all the Saab Owners Club members who voted her the best 9-5 at the SOC national event three years running. Heres some pics of her in her finest hour(s). Well there she is, the best part of seven years worth of painting & polishing, fixing & tuning, many cuts, brusies & sore fingers but to be honest Ive loved every second of it. A fantastic car that met her sorry end on the M54 near Telford early on a cold November morning, it was like having a loving faithful old dog put down. All very sad but shes not down & out just yet, who knows what the future holds? I'll update this page with any future news on The Black One if & when it happens.